Thanks to its location, from time immemorial Sarzana is an important crossroads of communication routes between the regions of Liguria, Tuscany and Emilia-Romagna. Sarzana is the second most populated municipality in the province of La Spezia. It is located a few kilometres away from the Ligurian Sea coast and from the borderline with Tuscany. The town still now preserves the ancient aspect of the medieval centre, despite the following fortification works, such as the walls, the towers and most of all the Cittadella, which modified the urban condition of the town. 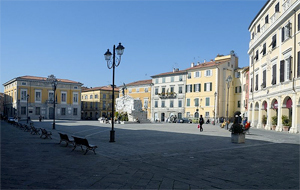 Nowadays, Sarzana makes tourism one of its main resources for its economy. Once here in fact, visitors can marvel at beautiful churches, picturesque monuments and fortresseses, large squares and characteristic suburbs, besides a tempting array of shops, workshops and boutiques. Here you will find the precious treasures of art, architecture and sculpture, protected by historical buildings and ancient cathedrals. In particular, two wonderful and impressive fortresseses remain intact, the Firmafede Fortresses or “Cittadella” and the Fortresses of Sarzanello, which have been recently restored. In addition, it is possible to visit the St. Andrew Church, which is certainly one of the oldest and most important monument in Sarzana, and the Cathedral dedicated to Santa Maria Assunta, which you can reach easily by walking through the streets of the historic heart of the town. Finally, besides cultural attractions, the areas surrounding Sarzana offer also the chance to enjoy the close Ligurian sea with the sea resorts in Marinella, just a few kilometres from the city. We are dealing with a striking sandy coastal about 3 km long. Access to the area couldn’t be easier, in fact you can reach it by bus, taxi or bicycle. And what about Sarzana’s culinary traditions? Well, good cuisine is easy to find here. There’s a wide range of restaurants, pizzerias and eating houses that you will be spoilt for choice! Sarzana’s cuisine follows with some variations the Ligurian and Lunigiana’s cuisines, especially the farinata, the focaccia and the testaroli. In addition to this, Sarzana is mostly renowned for its typical sweet, the Spongata, a cake made up of puff pastry stuffed with fruit. We remind you also that in Sarzana’s surroundings, you can find many small wineries producing many high quality white wines, such as the famous Vermentino belonging to Luni hills.